Aug 23 What Is A Bag Of Candy Worth? 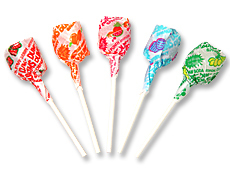 As a child, one of the great joys of my life was going through the bank or credit union drive-through with my mother and recieving free dum-dums at the end of the transaction. The teller would gaze knowingly into my mother's old Nissan Quest, see three restless children in the backseat, and send a few suckers along with the deposit. As we got older, the suckers became more and more scarce, and my sister and I would develop a routine: in the quiet moments after the deposit envelope and ID had been sent to the teller, my sister or I would sigh, and then exclaim loudly, knowing the microphone would hear: "....Man, I could really go for a sucker right now!" Without fail, the teller would smile and ask if she could send us some treats. OK, she was probably rolling her eyes at the precocious 12 year olds jocking for treats, but it made for awesome moments nonetheless. Point of this story? You can never overestimate the power of small considerations. As I've noted in earlier posts, the frequency in which people make physical visits to branches is growing lesser as people become more comfortable with emerging technology. More and more routine transactions are taking place in a virtual sphere. The only times that I've entered a branch in the past year, I've been in stress-mode: Lost debit card, meeting to refinance my car loan, or taking out a loan. At times like these, small considerations make a world of difference in my day. Does my mother look back on those days and specifically remember the suckers that gave her a brief respite from the chatter of a carful of kids? Probably not. However, I'm sure the fact that she had one less thing to juggle in that moment gives her a good feeling. A feeling that she associates with her particular brand of financial institution. Maybe its because I don't have any children, but I don't know if credit unions give out suckers anymore. Let's take some advice from some of the slickest people on the planet: car salesmen. At car dealerships, salesman want you to feel favored and lavished upon so you spend more money. Think about all the little perks they throw at you while you're making a selection: soft drinks, coffee, play areas for children, snacks and comfortable seating. This isn't to say you should make your credit union a playground or soup kitchen (though it would behoove your credit union to give back to your community in some way! ), but by spending a a few dollars a month - literally, this should last you a year - you've opened the door to allow people a reason and an opportunity to have good feelings about your brand. In business, every day we balance the worth of our decisions - remove funding here. Funnel resources here. How much is a feel-good brand association worth to you? Also: BRING BACK THE SUCKERS!